Huge traffic base, lots of games available. Great bonus offer, good on 1st three deposits. Widely considered the best software in online poker. This Full Tilt Online Poker Review is all about the online poker room known as Full Tilt. While going on tilt is the last thing you want to be doing as a poker player, Full Tilt Poker (FTP) is a site where if you play your cards right, that won’t happen. On the contrary, this is a place to play the games of your choice for the stakes of your choice in an entertaining but challenging online environment where your opportunities for fun and profit will be maximised to the hilt! Online poker has become so big in New Zealand with so many places open to you to play for real money, trying to decide on just one can be daunting. But as this Full Tilt poker review will show you, there is much to recommend about this site. Full Tilt is not for everyone, however. For example, if your intention is to only dabble in poker occasionally as a diversion, you really don’t need to be playing on a site that is such a tremendous hubbub of activity. 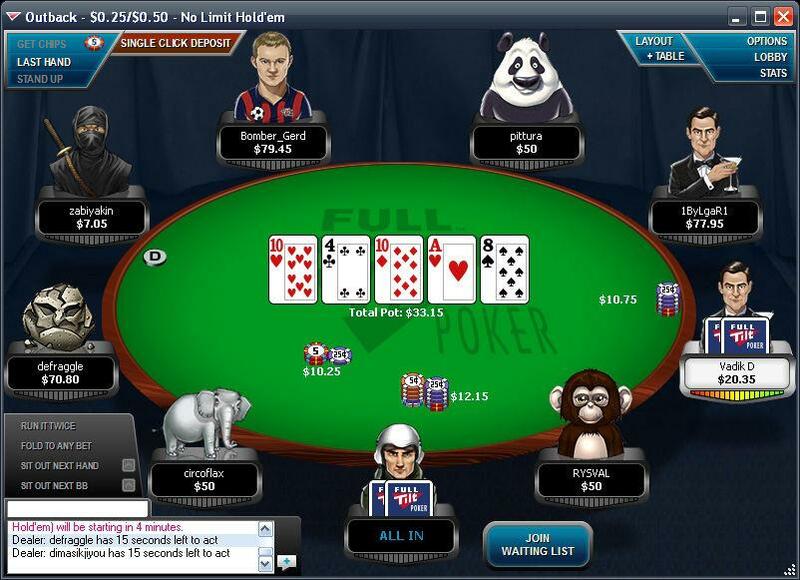 In addition, residents of some countries, such as, for now at least, the United States, are not allowed to play for real money on Full Tilt Poker. However, New Zealandn players are welcome. So if you love poker and are looking for a place where you can elevate your skills and profit to the next level, what are you waiting for? As you may already know, Full Tilt.com and another highly regarded, high profile site, the separately reviewed PokerStars.com, not only have many features in common; they both fall under the same ownership umbrella. At one time they did operate as two completely separate sites, but in 2012, the Full Tilt site was acquired by PokerStars, and in 2014, another company, Amaya Gaming, became the new owner of both FultTilt.com and its then parent company, PokerStars.com. Like PokerStars.com, FullTiltPoker.com has a long and colourful history leading up to these developments. Full Tilt Poker, which was established in 2004, by professional poker players, became very popular with poker pros and was considered in its heyday, both in the U.S. and internationally, to be one of the top online poker rooms. However, on April 15, 2011, the day known as “Black Friday,” the site was shut down by order of the U.S. Government. Eventually, an agreement was reached with the U.S. Department of Justice, where by the Rational Group, then the parent company of PokerStars, was allowed to purchase the assets of Full Tilt and issue refunds to players on both sites. 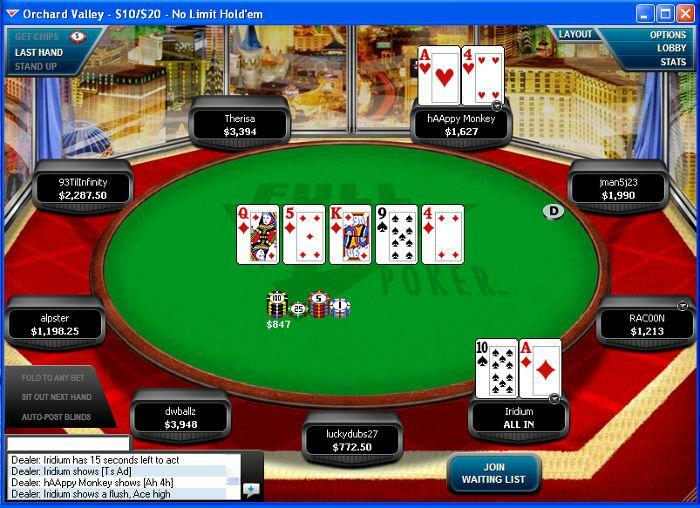 By November, 2012, FullTilt.com was up and running again, and ever since, old and new players alike have been flocking to the site, eager to play. However, as of this writing real money play still remains off limits on both FullTilt.com and PokerStars.com to anyone from the U.S. When state-run online gambling became legalised in New Jersey in 2013, Resorts Casino chose PokerStars as its partner, but the application for a licence was denied. Then, in August, 2014, Amaya Gaming purchased both PokerStars and Full Tilt, in the hope that the change in ownership would clear the way for the New Jersey Division of Gaming Enforcement to change its mind and allow both sites to operate in New Jersey. The matter is still pending, but if official approval is granted, it now appears that Caesars Entertainment rather than Resorts would be the likely casino partner. Meanwhile, regardless of what the future of FullTilt.com may be in the U.S., as a player in New Zealand, you don’t have to worry. Full Tilt Poker is not going anywhere, and you can sign up to play today! Our Full Tilt poker ratings are based on many criteria. You will learn more about the Full Tilt online poker rating we have for different categories in the discussion that follows. Here are six compelling reasons to play on Full Tilt. FullTilt.com is affiliated with PokerStars.com, the No 1 poker site in the world. In addition, the new owner, Amaya Gaming, is a well-respected and very financially solid company and a leader in online gambling. This combination provides a high level of confidence that Full Tilt will continue to offer the wide variety of high quality games and tournaments you are accustomed to in a safe and fair online playing environment. Full Tilt is a high traffic site offering a tremendous variety of ring games and tournaments. Full Tilt Poker is always a hubbub of activity. You can use play money or real money, your choice, and either way, you are not tied down to your own home computer to play. If you own an Apple iOS or Android device, the state-of-the-art mobile apps allow you take advantage of the same customised advanced options and wide range of ring games and tournaments that are available to computer players. If you plan on playing online poker often, the quality of the site’s Welcome Bonus, loyalty rewards, and promotions can make a big difference both in your incentive to continue playing on the site and your bottom line. As a new FTP player, you are offered an exceptionally generous Welcome Bonus when you sign up plus many more benefits with continued play through the site’s tiered rewards program and other exciting promotions. If you have ever dreamed of competing against some of the very best poker players and maybe beating them, here is your chance. The person sitting next to you in a Full Tilt tournament could be a world famous poker player. Imagine the look of I can’t believe it on both of your faces if the star poker player were to go all-in and you were to take all of his or her chips! Full Tilt Poker also gives you the opportunity to qualify via satellite to compete offline in world class events. On the other hand, maybe you are brand new to the game, or fairly new, and far from ready to compete against top level players. In that case, FTP gives you the opportunity to learn the ropes at tables where your opponents are at the same level as you. A variety of safe and secure deposit methods are open to you, including all of the following: MasterCard and Visa, NETELLER, Skrill (Moneybookers), Click2Pay, ClickandBuy, Wire Transfer, and echeck. The minimum deposit is only $10. Or you can fund your account with $50-$600 almost instantly with MasterCard, Visa, or NETELLER with Single Click Deposit. If you also have a PokerStars account, another option is to transfer funds from that site. Although New Zealand is not currently on the list shown on the website of countries that allow this option, keep checking because that might change soon. Also check the website or email Customer Support to see which methods can be used for withdrawal. Full Tilt Poker is powered by its own proprietary software called TiltWare. The state-of-the-art software, which is compatible with both PC and Mac computers, is surprisingly user-friendly and easy to navigate. The lobby is conveniently organised according to each broad category of games offered: ring games, Rush poker, Sit and Gos, Jackpot Sit and Gos, and multi-table tournaments. So finding and being seated in the game of your choice couldn’t be simpler. Also, unlike some online gambling sites which are less than forthcoming on important details regarding games offered, banking options, and the and the terms and conditions of the Welcome Bonus and players rewards programs, the Full Tilt website provides complete information and explains everything in crystal clear terms. If you enjoy playing casino games as well as poker, you will be happy to know that Full Tilt is not just for poker but offers an online casino, too. Slots, blackjack, roulette, and baccarat are all available, and you can even play blackjack, roulette, and baccarat with a live dealer. Play in either standard view or mini-view. FTP Hand Replayer: Allows you to replay and review every hand you have played during your current session. Run It Twice: This option is offered at select No Limit Hold ‘Em and Omaha ring game tables In an all-in situation, if you are heads-up with another player and you both have opted in for Run It Twice, the remaining community cards are dealt twice. The winner of each outcome wins half of the pot. Check Edge loyalty program status: Use Lobby widget to quickly check your status in the Edge rewards program. Customised table background: Adjust the background for your table (i.e., jungle, beach, or outer space). Customised avatars: Personalise your avatar as you wish. You can even right click on your avatar to change the facial expression. 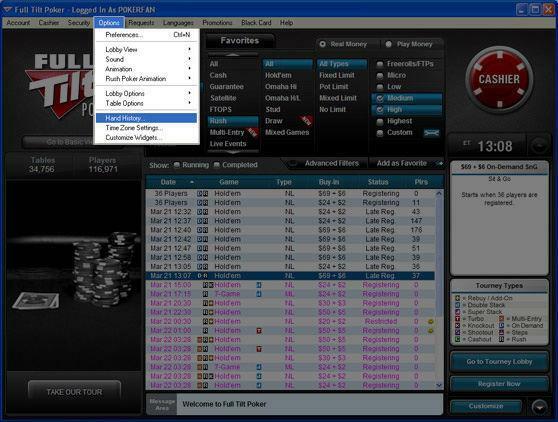 Another option that remains available, but to computer players only, is multi-tabling. If you use your mobile device, you can only play one game at a time. This is a shortcoming that needs to be corrected since many mobile players like to play more than one game at a time. You will find more information about the site’s mobile platform and our Full Tilt Poker rating for mobile play below. One option that was previously available but recently eliminated was the ability to choose any seat at any table you wanted in ring games. Now your seat is randomly assigned. The new rule, which we applaud, is designed to help prevent highly skilled players from deliberately seeking out and preying on the weakest players. 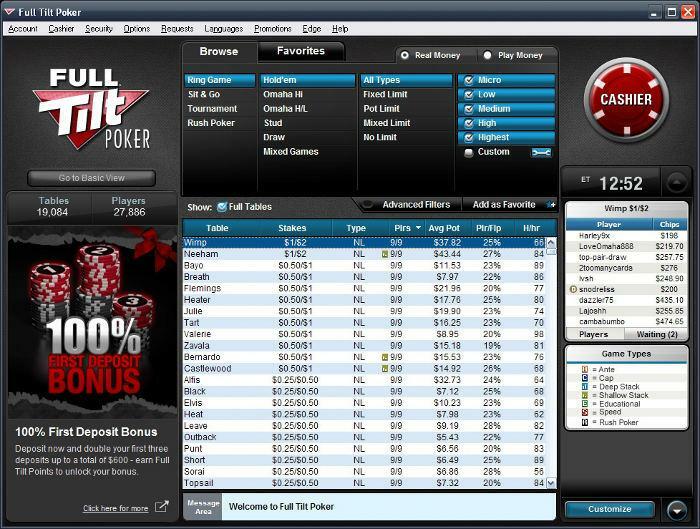 All of the Full Tilt poker games (both ring games and tournaments) that are available to computer players are reportedly also available to mobile players. In fact the two modes of play use the same player pool, so you could be playing on your mobile while the person next to you is using a computer. You can also switch back and forth between computer play and mobile play, depending on which format is more convenient for you at a particular time. If you have already set up a Full Tilt poker account from your computer, you can log on with the same account to play on your mobile device. Alternatively, if you do not have an account yet, you can use the FTP app to create one. You can also use the mobile app to fund and make withdrawals from your account and access the Welcome Bonus and other promotions, and for your convenience, the apps are available in a variety of languages. You will need a Wi-Fi, 3G or 4G connection. However, a Wi-Fi connection is preferable. If your iOS device needs updating, you can connect it to your PC and obtain the update via iTunes. Ordinarily, it is easier to play on a tablet than a smartphone because the buttons and screen are larger. However, that might not be the case here. Even though the app will work with iPads, it is not fully optimised for them so you might encounter some problems. Android device users should visit www.fulltilt.com on their mobile device and follow the instructions for downloading. The app will work on Android 2.3 and higher, with a minimum screen resolution of 800x480. Some of the newer devices which should be compatible include the Samsung Galaxy, Galaxy Nexus, and Sony Ericsson Xperia X10 and X13, just to name a few. Besides these apps for the regular Full Tilt games and tournaments, FTP has released another app specifically for Rush Poker. This is a super-fast low stakes game (similar to the game called Zoom Poker on PokerStars.com) where when you fold, you do not have to wait for the other players to act. Instead, you are immediately moved to a new table with new players. Rush Poker can be played for either play money or real money on IOS devices of 4.0 or higher. It cannot be played on Android devices. If you have any questions or run into any problems using your mobile device, customer support is available, via email only, at support@fulltilt.com. If we were to assign a numerical rating from 1 to 10, our overall Full Tilt rating for software would be an 8. We give very high marks for the easy to navigate website, and completeness and clarity of information. In this Full Tilt poker review, we give Full Tilt very high marks as well for being able to offer not just computer players, but also mobile players, a full range of games. However, there are shortcomings in the apps which need to be corrected. Priority should be given to improving the quality of play on iPads, supporting play on other commonly used mobile devices, and enabling multi-tabling. In addition, all players should have access to immediate 24/7 customer support via live chat or phone instead of having to wait for an email response. While there is no doubt that hold ‘em, especially no limit hold’em, is what most people nowadays want to play, you can either choose a site where hold ‘em is the only game being offered, or you can choose a site like Full Tilt which gives you a choice of games. Full Tilt Poker not only offers multiple varieties of poker in its ring games, but more tournaments in more formats than you can possibly imagine. The wide range of stakes you can play for on this site should fit the needs of most players. Ring games are even available for micro-stakes starting at .01/.02 with a 40 cents buy-in, along with lots of low and mid-stakes games. However, the high stakes cash games that were offered previously have recently been eliminated. Buy-ins are sometimes as little as $1 for Sit and Gos and as little as 10 cents for regular tournaments. There are also tournaments with substantially higher buy-ins. You also have the option to use either play money or real money. The FTP play money games are not completely free because there is a small cost for chips as well as a small rake in ring games and small entry fee for tournaments. Play money games are not only for beginners. For example, if you would like to play for high stakes, but do not feel comfortable risking real money, you can buy a huge stack of play money chips and become an instant high roller! On the other hand, if you would rather play for real money than play money, but would like to get your feet wet and improve your skills without risking a huge amount of cash, micro-stakes games are a great option. If you are new to poker, these tables provide another great way for you to try different types of ring game games and tournaments and improve your skills. Best of all, you can still win money, but the games won’t cost an arm and a leg because you are playing against other people at the same level. Play is at a slower pace than at standard games, and there are special tools like display of hand strength to help you along the way. New to the game tables include the smallest stakes the site offers, and you are limited to two tables at a time. Eligibility to play is based on number of hands you have played on the site. The maximum number is 2,000 hands in the same type of game in a ring game or 75 in a sit and go or tournament. After that point, you no longer have access to the same type of New to the Game tables, though you can still use them for other game variations for which you have not yet reached the quota. Rush Poker is a very fast form of poker, where as soon as you fold, you are moved to another table. It is for micro-stakes and low stakes players only, with betting limits ranging from .02/.05 to $2/$4. However, in other ring games, you can generally choose from a much wider range of betting limits. Also check the lobby to see what, if any, additional games might be available. Recent sweeping changes to the ring games on this site have resulted in the removal of some less popular games like Stud and Mixed Games and all heads-up and high stakes cash games. Rush on Demand Sit and Go: Rush Poker with a $4.40 to $20 buy-in. Matrix Sit and Go: You play the same opponents at four different tables simultaneously. Step Sit and Go: There are different levels with different buy-ins ranging from $1 to $2,100. Don’t dismiss freerolls as a waste of time. Not at FTP where more than $10,000 in cash and ring game and tournament tickets are waiting to be won in these freerolls every week! These are super-turbo format sit and go freerolls with just three players, with a randomly determined prize pool up to 2,000x the buy-in. As long as you have played at least one real money game during the past week, you can play one Jackpot Sit and Go Freeroll daily. The games run continuously 24/7. Daily Freerolls are offered at New to the Game tables 3x daily, with $50 in tickets for ring games and tournaments up for grabs. An additional daily freeroll awards tickets for mobile games. The games are not necessarily no limit hold ‘em. However, all of the freerolls use a turbo or super-turbo format. Every Sunday two no limit hold ‘em freerolls take place. Play is limited to the top 200 finishers in the daily freeroll qualifiers. Once you reach an Edge status level, you are invited to enter two special freerolls daily. Each freeroll has a $500 prize pool, consisting of either ring game tickets or tournament dollars. Sunday may still be a day of rest for some people, but not for players at FTP Guaranteed tournaments, like these three (and many more) run all day long. This $125,000 Guaranteed Tournament starting at 13:30 ET is the biggest tournament of the week. You can buy in directly for $250 or qualify by satellite. Re-entries (up to 3x) are allowed during the late registration period. The starting stack is 6,000 chips. There is another $50,000 waiting to be won in this tournament getting underway at 14:00 ET. The buy-in is a whopping $500, but it is possible to qualify via satellite for much less. At FTP, tournaments are up and running all day every day. Here is just a small sample. 1 Up Tournaments: The object of these tournaments is to try to finish in the money multiple times. Avatar Tournaments: These tournaments with buy-ins ranging from $2.50 to $100, offer an avatar as the prize in lieu of cash. The Full Tilt International Poker Open Tournament got underway in May, 2019 and will continue until April, 2019. You can earn a seat in the next stop by playing in a qualifying tournament online. See the website for details. FullTilt.com is still a high traffic site, but it has taken a substantial hit recently, which experts attribute to the major overhaul of its ring games. Cash game traffic is now down to about 800 players. Experts attribute this player attrition not only to the removal of all high stakes cash games, but also to the fact players can no longer choose a specific seat or deliberately seek out or avoid specific opponents. As a result, high stakes players and grinders have been leaving Full Tilt in droves, taking their business elsewhere. FullTiltPoker.com seems to be taking a different direction from PokerStars.com in reinventing itself at a site that that caters not just to skilled players, but also to recreational players. Customer Support is currently limited to email only. The FullTilt.com Welcome Bonus is available to mobile players as well as computer players. It consists of a generous 100% of your first deposit up to $600. You are given 60 days to clear the bonus in full by playing poker games on the site and accumulating Full Tilt Points (FTPs). The bonus clears at the rate of $1 for every FTP earned (i.e., to release a bonus of $20, you need to earn 500 FTPs.) and is released in increments of 10% of the deposit or $20, whichever is less. Even though you are using points to clear the bonus, you still get to keep and accumulate those points. They can be exchanged for tickets for ring games and tournaments or be used to enter exclusive tournaments. Welcome freerolls take place daily at 10:15 and 16:15 ET. All new depositors are invited to enter both freerolls every day for 30 days and play each time for a share of $200 worth of tickets for ring games or tournaments. As of August, 2019, there have been major changes in the FTP loyalty rewards program. You now have a choice of either Players Club rewards or Edge rewards. You must select one or the other and cannot claim both benefits simultaneously. However, you can switch to the other rewards program later. This is a special game using a coin that is earned playing real money games. You are dealt seven cards face down. After you discard two cards, your remaining five cards determine your prize. If you hit a Royal Flush, you could win 50% of a progressive jackpot. Each time you play for real money at least three days in the same week, you receive a $5K Weekly Windfall Flip Freeroll ticket. New players also receive an extra free ticket after their first real money playing session. Daily Freerolls and Jackpot Sit and Go Freerolls: Open to anyone who has played for real money in the last week. Sunday Depositor Freerolls: Open to anyone has made a deposit in the last week. Weekly cashback based on play. Opportunity to exchange FTPs for cash. Access to an exclusive online store. Monthly Edge Leaderboard for a chance to win cashback boosts or additional tournament tickets. Full Tilt has been operating online for a long time. Despite its checkered history, the site, under its current ownership and management, seems committed to doing right by its players. We give a very high Full Tilt online poker rating for the recent changes to make the games fairer and friendlier for less skilled players. Safety is also a priority; the use of digital encryption technology ensures the complete privacy and security of every player’s account. While a very high Full Tilt online poker rating can be given in most of the categories that are important to players, this Full Tilt online poker review would not be complete without also mentioning a few areas which can use improvement. No U.S. players allowed. Hopefully, this will change soon. New apps are needed that support play on other mobile devices besides IOS and Android devices, work better for iPad play, and allow multi-tabling. Customer Support is limited to email. 24/7 live chat and phone support need to be made available. Our overall Full Tilt rating is very positive. Like its sister site, PokerStars.com, FullTilt.com offers a full schedule of both ring games and tournaments with more than enough variety to appeal to most players. Unlike PokerStars.com, Full Tilt is showing a demonstrably increased interest in encouraging more recreational players to sign up, as indicated by major changes in the ring games and loyalty program. The influx of players from the Full Tilt Casino should also increase the number of casual players. With exciting new promotions being introduced that are open to everyone, this might be the perfect time for new players looking for beatable mid-stakes or lower level games to join. play now Claim your 100% welcome bonus when you sign up!